The Ridgid ZRR2740 is a small, lightweight belt sander, which packs more power than its 6.5AMP motor might suggest. 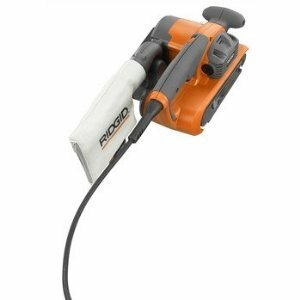 Featuring both auto-tracking and electronic feedback, the Ridgid is designed with the user in mind, and is clearly setting the bar for quality and value, with an affordable price and strong performance. While 6.5AMPs probably isn't going to be enough power for regular professional use, the ZRR2740 gives a good show for its size. It would be an ideal purchase for dedicated hobbyists and furniture or cabinet makers who are looking for an affordable yet durable workhorse. The best feature of the Ridgid is its twin-fan design: one fan cools the motor, while the other directs dust into the dust collection bag, which is included. This means the sander is less prone to overheating, and can therefore run longer – ideal when you're pushed for time. It is also fairly quiet during use, which is a bonus for those living in apartments, or with neighbors who don't like being disturbed. All handles are soft grip, making the ZRR2740 a comfortable sander to use, even over long periods on heavy jobs. If you're a professional, you may feel more comfortable spending $100 or so more to buy a brand new sander, just for peace of mind. However, for the high-volume hobbyist or home-improvement enthusiast who doesn't mind buying reconditioned tools, this sander is surprisingly good quality, yet compact and lightweight enough to suit a basic tool kit.